Amazon Studios has posted eight new comedy pilots at Amazon.com, which they are allowing viewers to watch and leave their feedback before the studio decides which of these projects will go to series. The greenlit projects will eventually go on to become part of Amazon Prime's original streaming content. We're taking a look at all of them and sharing our thoughts on each of them this weekend. Here are the reviews for Alpha House and Onion News Empire. Written by Doonesbury cartoonist and creator Garry Trudeau, Alpha House is a peek into the absurdities of Washington politics. Rather than ideologies, it trades in the strange specifics of being a politician. It’s less interested in why people are filibustering and more interested in how they figure out what to talk about when they’re rambling at the microphone. Instead of wondering why people get indicted, it worries over the annoying practicalities of actually being indicted. And more generally, it asks one burning question all elected officials in our nation’s capital must deal with: if you’re real house is back in the State or District you represent, where the hell should you live in Washington? 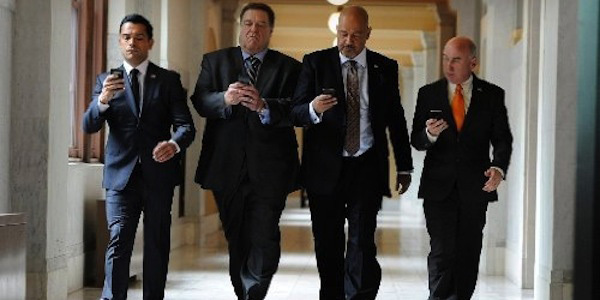 The solution is to get a house with other Senators, and that, in short, is the basic plot of Alpha House. Four Republican Senators, ranging from very experienced to brand new, live in a house together to cut down on life clutter and expenses. Obviously, the premise is rife with comedic possibilities and potential shenanigans. Fortunately or unfortunately, it’s also rife with partisan politics too. Veep is another comedy that tackles Washington, but on the whole, the HBO offering doesn’t really seem to forward an agenda. Because all four protagonists are Republicans, Alpha House may not be able to say the same thing. During the pilot, issues like gay marriage and the threat of ignorant Tea Party candidates beating you in the primary are examined. On the one hand, that’s completely reasonable since those are the issues Republicans actually do deal with, and they’re extremely ridiculous.. On the other hand, however, since there aren’t any Democrats on the show, it can still feel a bit biased. Are Republicans being skewered because the show happened to choose Republicans? Or are they being skewered because creator Garry Trudeau doesn’t think there’s as much hypocrisy and goofiness on the left? If the show is picked up, we should find out, but with only one episode, it’s really hard to tell whether there's an agenda in play or not. Regardless of whether it’s biased or not, Alpha House has some funny and original thoughts to offer. It’s not quite laugh out loud hysterical, but with leads as talented as John Goodman, Clark Johnson and Matt Malloy, it definitely has the potential to get there. Onion News Empire is a joke machine. It sets itself in the middle of a network news office, and it uses every available method to try and generate laughs. Sometimes it lets anchors deliver the comedy via the standard broadcast news format. Sometimes it lets its character trying to find the news tell the jokes, and sometimes it simply lets the joke sit somewhere in the background. This chaotic, scatterbrained approach is a bit reminiscent of Airplane or the Naked Gun movies. Unfortunately, that approach doesn’t work nearly as well on television. Television shows need at least a basic level of character development. The protagonists and antagonists need to be more than just vessels to deliver comedic lines because they have to coax the audience into tuning in each week. The men and women who work in the Onion News Empire are so over the top, however, they really don’t have any actual personalities at all, or anything in common with reality. They’re just wild caricatures. 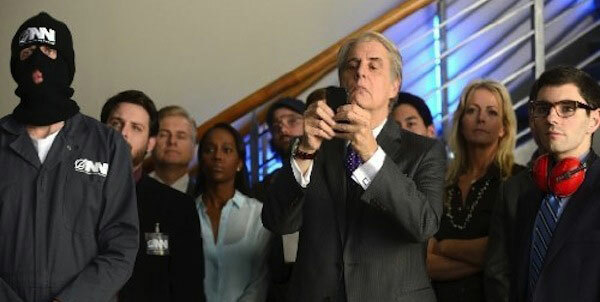 Jeffrey Tambor’s veteran anchor engineers the kidnapping of a little girl. Cheyenne Jackson’s up and coming newsman is third grade stupid and Christopher Masterson’s new hire throws away his perspective within an hour of his arrival. They're just clay to be molded in whatever direction can generate the most laughs in any particular moment. Are there some good jokes to be had? Yes. Is there a particularly funny or interesting take on the news at the heart of the show? I don’t know. Maybe. It’s impossible to tell amidst the sheer number of guffaws attempted. It just spits them out like an automatic dealing machine without any idea of their tendency to bury the legitimately good ones. I’m not saying I wouldn’t be interested in getting more from The Onion. I’m just not sure I’m interested in seeing more of this format without some tone changes or major alterations. Read the reviews for Dark Minions and Browsers here.